Accu-Precision recognizes that to sustain its strength it must win the competition for the best talent. Located in a modern, air-conditioned facility in beautiful Littleton, Colorado, we offer the opportunity to balance the intensity of our work environment with some of the best neighborhoods and recreational activities available. The company aligns its economic interests with the desires of our craftspeople to build and create unique and challenging parts. By having tools and helpers readily available to our cell leads, we are able to quickly and efficiently create results for our customers. Customers are interested in completed parts and assemblies, and our administrative staff is there to achieve this goal above all others. Our lean support staff of clerks, engineers, and account representatives is dedicated to adding value and providing excellent customer service both externally and internally. Core to our current strength are the trainees we hired a few years back who are now filling leadership positions. We are looking for people who have a passion for all things mechanical and a willingness to invest in learning. The company offers competitive pay, a benefits package, which includes health care, a profit sharing pension program for vested employees, and various other incentives. 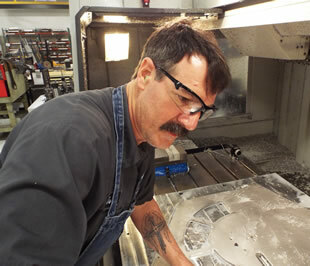 Accu-Precision strives to hire only the best machinists and technicians. As a result we are opportunistic and will always find openings for truly exceptional performers. If you are an experienced machinist or AMP and would like to become part of the Accu-Precision team, please fill out our application form. Let us know what skills you possess that would make you an exceptional addition. Note that all new hires will start on our evening (3:00 pm to 1:00 am Monday – Thursday) or weekend (6:00 am -6:30 pm Friday – Sunday) shifts. Accu-Precision fills its weekday shift openings with current employees from the evening or weekend shifts. Even if we are not actively recruiting, we are always looking for talented individuals to join our team. Please fill out our employment application and we’ll keep your information in mind for future career openings.